The decade from 1925 to 1935 saw exciting attempts to wring more and more speed from often frail aircraft structures, the enthusiasm for these attempts being engendered by the rapidly growing sport/spectacle that began in the United States and was known as pylon racing. The classic in this category was the Thompson Trophy, first flown in 1929. The races of 1931 and 1932 were won by Granville Bee Bees, amazing planes which could reach almost 300 mph. Designed and built by the five Granville brothers (hence the popular name Gee Bee or GB), the Model R Super sportster was typical of the racing version at the peak of its development. 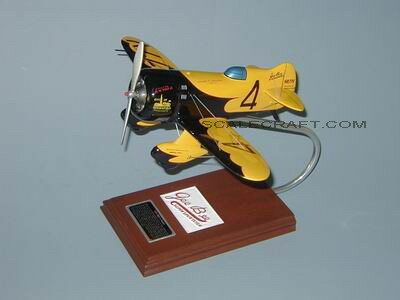 The legendary "Jimmy" Doolittle had flown a Gee Bee to win the Thomson Trophy of 1932, and on September 3, 1932 he set a world landplane speed record of 296.287 mph in the Model R-1. However, within a year, both the Model R-1 and R-2 had crashed, and in 1934 the eldest of the five brothers, Zanford (nicknamed "Granny") was killed in another accident, and with the driving force missing, Granville Brothers slipped into bankruptcy. Mahogany Wood. Scale: 1/20. Wingspan 14 1/4 inches, Length 9 inches.